As the Washington Auto Show kicked off in early April, the Sierra Club’s Clean Transportation for All campaign — alongside our partners at Public Citizen, Interfaith Power and Light, and the Safe Climate Campaign — took the opportunity to address the huge T-Rex in the room: The Trump administration is on the verge of scrapping our most effective climate policy against climate change, the clean car standards, and automakers are the ones that asked for this attack in the first place. 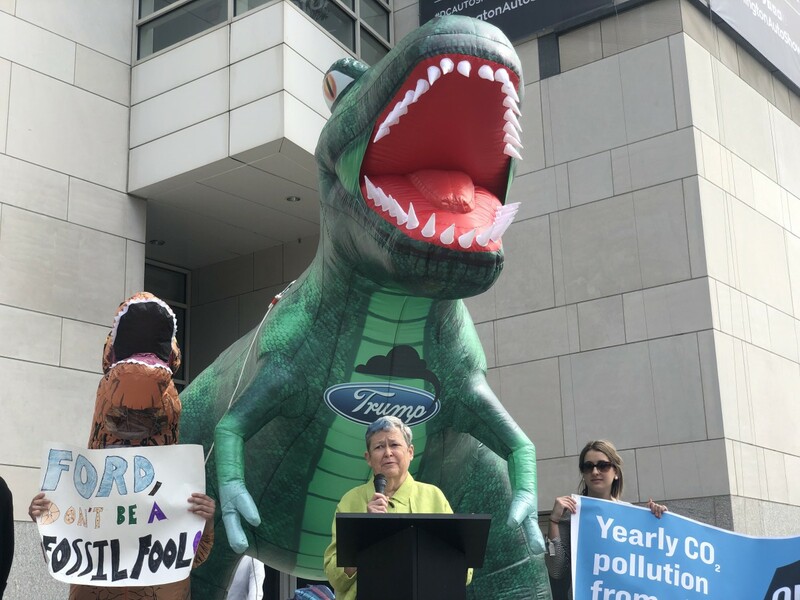 This auto show was the second of the season where our coalition has targeted Ford and its lobbying of the Trump administration. The inflatable dinosaurs — representing the nine tons of carbon pollution that a Ford Exhibition puts out annually, which is equivalent to the approximate weight of a T-Rex – also made an appearance in Ford’s hometown at the Detroit Auto Show in January. In 2012, Ford and other automakers stood with former President Obama in the Rose Garden as he announced the deal on the popular clean car standards. Expected to prevent over six billion tons of carbon dioxide from being released into the atmosphere, while saving consumers thousands of dollars at the pump on gas prices, these common-sense standards have been under attack from the Trump administration. The administration’s rollback is expected to be finalized sometime this spring or early summer; it keeps getting delayed, but it shouldn’t even be happening in the first place. Unfortunately, this is par for the course of an administration that doesn’t believe in climate change or science. During the auto show’s press day, the same day as our T-Rex acton, EPA Administrator Andrew Wheeler had the nerve to say that he hopes that California doesn’t sue the administration over the rollback and revoking California’s waiver. It’s hard to wrap our minds around that comment when the waiver has been ensuring the right of the state — along with 13 other states and the District of Columbia — to protect communities from dangerous air pollution since the 1960s. But what’s equally as disappointing is automakers claim to believe in science and climate change in public spaces, but nonetheless have worked with this administration behind closed doors to roll back these vital climate and consumer standards. Last August, at the urging at the auto industry, the EPA and NHTSA proposed their own plan which would freeze improvements in fuel economy and GHG emissions at the 2020 baseline, along with revoking California’s waiver under the Clean Air Act to set tougher rules than federal standards This plan would lead to hundreds of millions of tons of CO2 being added to the atmosphere. The EPA’s own hand-picked environmental adviser has said it will cost the country hundreds of thousands of jobs. Instead, some automakers claim that the current administration is going way beyond what they asked for. But don’t be fooled, the loopholes that automakers have asked for will lead to more pollution, some even worse than the rollback! However they spin it, these automakers are working to undermine the clean car standards, important climate and consumer protections that have been proven to be achievable and working. After several of them were bailed out or granted loans by the American taxpayer, this is unconscionable. We will continue to hold Ford, other automakers and the Trump administration accountable for their actions, because we care about protecting our air, climate, and health, and we have concerns about U.S. oil dependency and the many problems that it creates. Protecting the clean car standards is a key vehicle — pun intended — to tackle our existing transportation pollution problem.